If your brand is in the business of warming the heart, there is one moment of the year that stands out: Valentine’s Day. However, the business of finding and manifesting love is a year ‘round affair; insights on both Valentine’s Day and online dating can be valuable focus areas for savvy marketers. The desire to invest in love is on the rise – in the US, Valentine’s Day saw a total spend of $18.9 billion in 2015, a 10% increase from 2014. For the fourth largest spending holiday of the year, brands need to be aware of who is spending online, what they are buying and how. When planning ahead for paid search campaigns for Feb. 14, it’s important to maximize your chances of reaching the full scope of those who will be celebrating. In June, there were 88 million retail searchers active across Bing Ads who represent 36% of all retail paid clicks and 53M of these are not reached on Google. So, what are people searching for in the lead up to Valentine’s Day on Bing Ads? The majority are looking for the appropriate gift (40%), while 16% are offering flowers, 15% jewelry and 10% want to offer something sweet (see graph below). Interestingly, the Bing Ads audience, compared to Google, is 11% more likely to have spent $100-199 on flowers, 23% more likely to have spent $500 or more on jewelry and 8% more likely to have used paid service for gift certificates in the last 6 months. It is also good for brand owners to understand when people are going to be looking for the perfect package, bouquet or necklace, as well as where they will be looking. Put simply, Valentine’s Day shopping heats up in the first 2 weeks of February, with a particularly burning set of activity on the 13th and 14th itself, and over one-third of searches take place on mobile. It could well be worth wooing shoppers with longer lead cross-screen campaigns to get ahead of the competition. Should this timeframe seem a little tight, remember that people are seeking the love connection throughout the year – in fact 10% of US adults use online dating sites. The number of online searches for dating sites on Bing are the highest in March, April and May, with secondary peaks in July, October and December. 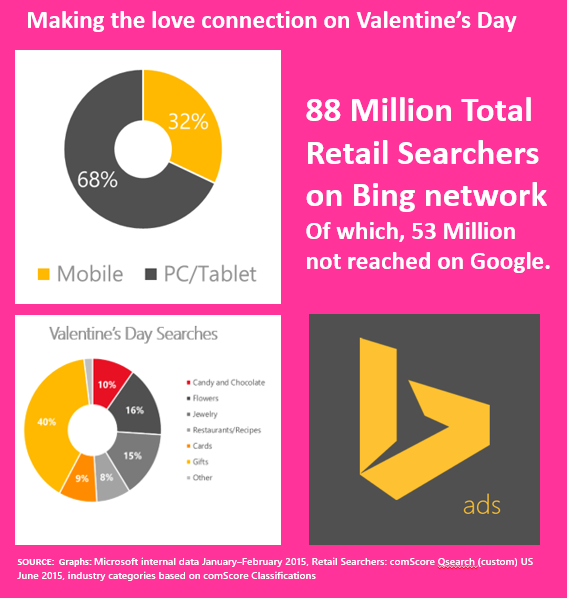 Bing Ads retail searchers are active online consumers – more likely to have spent a significant amount on the most common Valentine’s gifts in the past 6 months. Love is a personal thing and people are increasingly turning to their most personal of devices to search for purchases related to the heart – over 30% of Valentine’s Day and Online Dating related searches occur on mobile. It's never too late to make the love connection! There are peaks of activity with retail searchers looking for the right gift for those they love throughout the year. 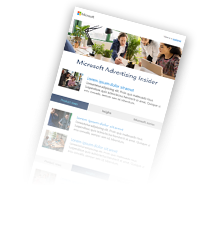 Go to Bing Ads Insights to learn more about CTR over time (week, day and hour), by category, as well as CPC over time and the optimal combinations of terms for ad copy for both Valentine’s Day and Online Dating audiences. As always, feel free to ping us on Twitter with anything Bing Ads related. For queries specific to our marketing insights, send them to me directly: @ShelbyGagnon. comScore gSearch (custom), US, June 2015: industry categories based on comScore classifications.